Gloucestershire sits in the South West of England, and encompasses part of the Cotswolds and the River Severn and all of the ancient Forest of Dean. Our county town is Gloucester and it would appear, according to Plantlife, that our county flower is the wild daffodil (who knew?). In the 10th century, our historic county was mentioned in the Anglo-Saxon Chronicles, with Winchcombe and the Forest added in the 11th, alongside the ‘small town’ of Bristol…which seems to have grown and slipped through our fingers! Our county is full of surpising places to visit and we hope that this website will help you find your way around, especially if you are planning a day out and want to see as much as possible. Whether you like a fine cafe with a museum attached, or open spaces where little ones can run free, you will find the museums for you here. Search by area to make the most of your visit. Through this site you will find museums, galleries and heritage sites grouped together in specific areas. This will show you what you can see either within a short drive, or sometimes within walking distance of each other. 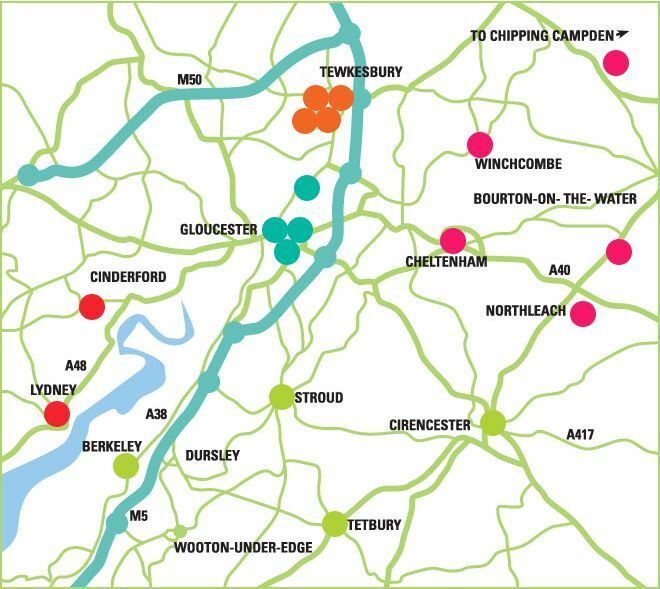 Whether you feel like a walk along the river and a visit to a museum, or perhaps a town or city centre trip plus a cultural stop with a good lunch or afternoon tea attached, Gloucestershire Revealed should make your planning easy. Nature in Art is unique – within the fine Georgian mansion can be found the widest range of nature-inspired art in the world. Spanning 1500 years, displays embrace work in all mediums and styles from across the globe. The collection contains the best creations of 600 artists from over 50 countries. So typically, as well as a temporary exhibition, you’ll find contemporary glass, watercolour landscapes, bronze sculptures, the Flemish masters, modern engravings and even some ancient oriental treasures. Re-opened in July 2011 the lottery funded and newly renovated City Museum will amaze you. Brand new interactive displays tell the story of Gloucester throughout history, and with craft, science and play zones throughout the museum there is something for everyone to enjoy. An inspirational, interactive and comprehensive collection portraying the history of two famous local regiments, The Gloucestershire Regiment (The Glorious Glosters) and The Royal Gloucestershire Hussars. Dedicated to the history of both regiments and the challenges of soldiering around the world, both in peace and war, the museum is a tribute not only to their traditions and achievements but also their century’s long links with the County. Classified for 30 years in the world heritage of humanity, the Palace of Versailles is one of the most beautiful achievements of French art in the seventeenth century. The former hunting lodge of Louis XIII was transformed and expanded by his son Louis XIV who installed his court and his government in 1682. Until the French Revolution, kings have succeeded, embellishing the castle each to their own. tower. Concentrating on the middle ages to the present day you find examples of the lives, crafts and trades of Gloucester people in this beautiful Tudor building. New features such as The Retro Room, Folk Tea Rooms and Folk Boutique have recently been added due to a substantial Lottery Grant. The cottage garden and education facilities have also been greatly improved making this hidden gem well worth a visit. The Museum is housed in a Grade II listed warehouse at the heart of Gloucester's docks and beside the Gloucester and Sharpness Ship Canal and River Severn. Its collections include objects that have been designated to be of national importance. Nestled in five acres of the scenic Forest of Dean is an old mill – a special place to explore the story of the forest and its people. Discover how the Romans turned the area into an iron-producing power and share in Royal Medieval Hunts. You can also sit by the open fire in the 19th Century Forester’s cottage and see the cottage garden where we keep our Gloucestershire Old Spot pigs and make cider on Apple Day. Not content with running their lovely steam & diesel trains (including Santa’s Specials) the DFR also operates a superb museum with a large collection of Forest of Dean and Severn & Wye railway memorabilia and telecommunication equipment. Combine a train ride through wonderful countryside with a visit to the museum for a perfect day out. Leave the streets of the 21st century behind and step into the warm and intimate world of the Holst family; their treasures, paintings, manuscripts and photographs offer a fascinating glimpse into the life of composer Gustav. Complete with a working Victorian kitchen, scullery, bedroom, nursery and miniscule maid’s quarters, this charming museum offers an interesting dip into social history and the music of one of our most famous composers. Due to major redevelopment work, the Art Gallery & Museum is now closed, re-opening from Spring 2013. During the closure period we are continuing to deliver an off-site programme in the Cheltenham area, Off the wall, on the move. Working with various partners and artists, there is a lively programme providing something for everybody throughout the year. Our main programme is inspired by the Antarctic Centenary, the Olympics and the Queen's Diamond Jubilee. Discover the story of the Arts & Crafts movment and its legacy, and how Chipping Campden became a magnet for designers and craftspeople with national and international repute, since the beginning of the 20th century. Here are two diverse collections, the first revealing Winchcombe’s fascinating past, through photographs, artefacts and memorabilia, and the second giving a unique insight into the history of the police, both national and international. Enjoy historic uniforms and equipment, and plenty of fascinating insights. See and hear a host of self-playing instruments in a Victorian setting. These amazing contraptions were the pride and joy of our Great Grandparentsand on our guided tours you can enjoy barrel organs, musical boxes, polyphons, automata, phonographs, gramophones and more. Located in a beautiful village, this fascinating museum is a vintage day out for the whole family to enjoy. Full of motoring memorabilia, the seven galleries are a nostalgic journey through the 20th century. The Museum is bulging with great cars, quaint caravans, curiosities, enamel signs and an enchanting toy collection the envy of every child (large or small!). Also home to BBC TV’s little super hero car, Brum, who can be found here every day. A unique row of 15th century buildings with so much to see and explore. Learn about the countryside with our natural history collection. See beautiful timber framed buildings and discover who lived in them. Hear voices from the past and the present with our audio wands. Read about author and conservationist John Moore. Wander in the peaceful Secret Garden. Delve into our Tudor character boxes. A local museum in a wonderful Tudor building, celebrating the town’s rich and diverse history with collections that range from early Roman and the Battle of Tewkesbury to the 20th century and the Mop Fair. Rummage in the dressing up boxes, test your knowledge with a quiz or play medieval games. There are special events throughout the year for visitors of all ages. A unique attraction set in a wonderful 17th century former Hat Shop. The three storey building houses a friendly visitor centre on the ground floor and a stunning exhibition and interactive heritage centre above, where you can explore this delightful market town's long and fascinating history using hand held visual and audio guides. Out of the Hat is a great place to start discovering everything thatTewkesbury has to offer. Although of cathedral proportions the Abbey is one of the largest Parish Churches in the country, it has stood on this site for the last 900 years. Enjoy the rich architectural and artistic heritage, including medieval stained glass, stunning roof bosses, exquisite tombs and chantry chapels and our 17th century Milton organ (played by the poet John Milton), still in daily use. Leave the 21st Century behind and discover the treasures of the Cotswolds at this multi-award winning museum, home to one of the largest collections of Romano-British antiquities from Corinium, Roman Britain's second largest city. Dedicated to the Gloucestershire Constabulary and fast becoming one of the main attractions in this lovely town, the museum is housed in the original Police office and (extremely secure) cells. Visit the first floor courtroom for a 1940s court case, or enjoy the records, helmets, uniforms, handcuffs, early lamps, bicycles and an early identi kit – just don’t fiddle with the two and a half turn locks! Fabulous 17th Century Mansion House, nestled in the beautiful surroundings of Stratford Park, housing colourful displays celebrating the rich and varied history of the Stroud District. With a full programme of temporary exhibitions and events there is always something fresh and exciting to interest, inspire or amaze you. Steeped in history, Berkeley has changed the world: the Chantry, an elegant 18th century house, is the former home of world renowned scientist and polymath, Dr Edward Jenner (1749-1823). It was from here in 1796 that Jenner developed the world’s first vaccine, saving millions of lives.